Many have compared Cape Town to the Bay Area, and with good reason. The Western Cape’s most prominent city is reminiscent of San Francisco with beautiful old buildings, amazing coffee, dramatic landscapes, microclimates, but most importantly, good wine and food! 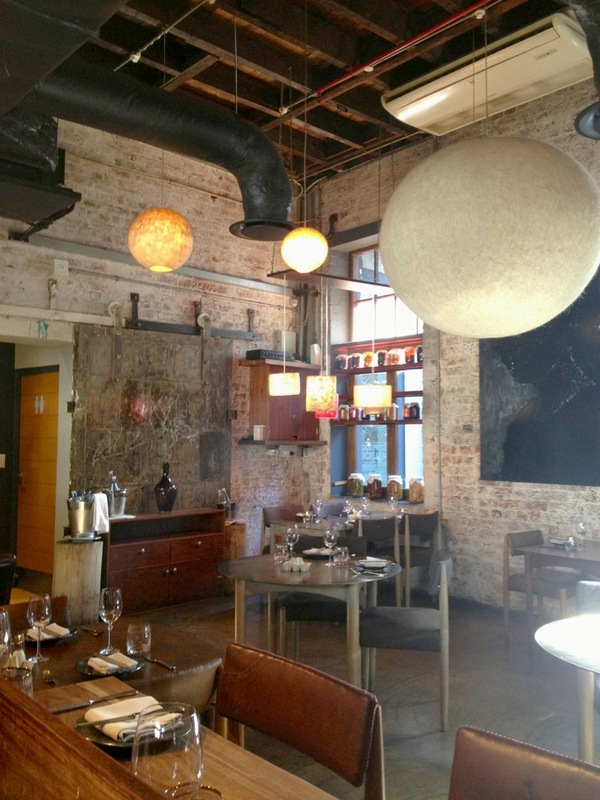 On a recent trip, I was fortunate enough to score a lunch reservation at The Test Kitchen. The contemporary restaurant located in the suburb of Woodstock at an outdoor shopping center called the Old Biscuit Mill, which has been repurposed from an old factory into a center of design, shopping, art and gourmet food. Upon Arrival, I was seated at the counter of their open-air kitchen and a couple members of the chef’s team introduced themselves to me. Luke Dale-Roberts, head chef, and his team serve up out of this world dishes. Diners are offered a five course-tasting menu with wine parings from the local wine farms, or can order a la carte. At this year’s Continental Restaurant Awards, The Test Kitchen was awarded 48th Best Restaurant in the World and The Best Restaurant in Africa. Even my high expectations were shattered when my appetizer came out! A plate with home dried tomato, black sesame and eggplant puree, burnt eggplant jelly, smoked goat cheese and aged balsamic was placed next to what I might call the world’s most impressive bread basket. Before my main course, I was brought a palate cleanser of lemon sorbet and grapefruit compote. The main course was a creamy Nicola potato salad, braised asparagus and lightly fried quail eggs. I slowly enjoyed each bite as I watched the kitchen staff swiftly prepare each dish. The restaurant’s sommelier paired my meal with a 2013 Bouchard Finlayson Sans Barrique, a dynamic white blend from a local boutique winery. For anyone really looking to treat their taste buds, I’d highly recommend swinging by the vegetarian friendly Test Kitchen. The Test Kitchen is located in Woodstock, Cape Town at the Old Biscuit Mill, and is best reached by taxi. A la carte dishes start at $9 (at conversation rate USD 1=ZAR10), and tasting menus are $47 ($69.50 with wine). Open for lunch and dinner, reservations required. +21 (0) 477 2337 or reservations@thetestkitchen.co.za.